Now, half a century after he resettled in Australia, Vincent Hart looks back on his early decades in Ireland. 1. Where did you grow up and what schools did you go to? I was born in Hull, Yorkshire, England in 1930, and would probably still be there were it not for the second World War. After primary school, I attended Marist College in Hull, and then, for one term, Wyggeston Grammar School in Leicester---whence we had moved due to the bombing. In December 1940 my father, who was in the Army by then, decided that my mother, myself, and two younger brothers, should move to family members in Cork, in neutral Ireland. And there I grew up very happily. In Cork I attended the Christian Brothers' College until 1947. 2. What first drew you to maths, and how old were you when you realized it was something you wanted to pursue above other options? At Christians' I received a sound education, my best subject being Latin. I could do mathematics also, but was not enthused by it---until at age seventeen, I read a book explaining how the Bohr atom was described by mathematics applicable also to the solar system: George Gamow's Mr Tompkins Explores the Atom (Cambridge, 1945). Then the scales fell from my eyes, and I became, and remained, very interested in the application of mathematics to the problems of the real world. 3. Tell us about your days as a student at UCC. At University College Cork, to which I was admitted on a scholarship in October, 1947, I enrolled for an Honours BSc in Experimental Physics and Mathematical Physics. This meant that I had to attend also the lectures in Mathematics---which gave me about 20 hours per week of contact. I graduated in 1950, with a medal, and took an MSc in Mathematics in 1951. I had good teachers: In Experimental Physics: J J McHenry, C O Ceallaigh, D J Stevens. In Mathematics: T M Carey, H St J Atkins. In Mathematical Physics: M D McCarthy for the first two years, and P M Quinlan for the third year. Front row: Professor H St J Atkins, P B Kennedy, Dr Tadhg (T M) Carey. Back row : T M Cronin, P J Donohoe, V G Hart, one unknown person. PBK is in the honour position since he has just been awarded the 1951 Travelling Studentship. Fellow students were T M Cronin, P J Donohoe, and P B Kennedy. All were very able, particularly Kennedy who won the 1951 Travelling Studentship in Maths; he was a year ahead of our group of three only. He was in a class by himself in every way (he was the only BSc student in maths who graduated in 1949). We caught up with him for the MSc in 1951. He had two years to prepare for the Studentship; we had but one year to prepare. All four of us (Kennedy, Cronin, Donohoe, me) obtained our MSc (or MA for Donohoe) on our answering on the Studentship examination. P B Kennedy later became Professor of Mathematics, first in Cork, and then in York. I learned a lot from my contemporaries and enjoyed their company very much. 4. After your masters, in 1951, you taught for a while at UCC and began your association with DIAS. How that that come about? 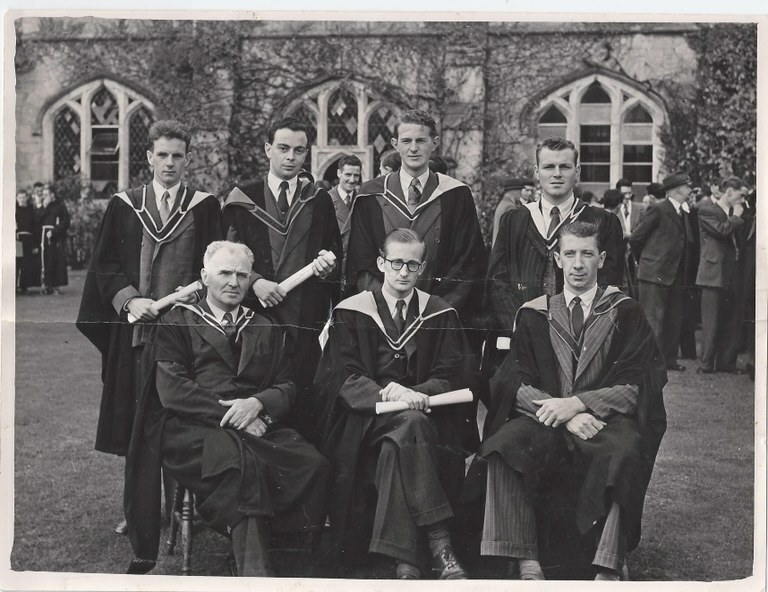 After BSc graduation in October, 1950, I was offered a teaching post (as Assistant I believe) at UCC. This I held for nearly two years until I applied for and was granted a position as Scholar at DIAS. This was a research position which I held for two years, being supervised by J L Synge, until I was offered a Temporary Lectureship back at UCC in mid 1954. This became a Statutory Lectureship in 1958, which I held until resignation in 1966. 5. What was it like working with Synge, and what was the nature of that research? Did you visit DIAS a lot to do more work with Synge in the period 1954-1957? Professor Synge was impressive in various ways. He was an excellent lecturer with a very clear style, as a supervisor he was excellent, very experienced and understanding. I was fortunate to have him as my PhD supervisor: by contrast to the experience of a friend, who was given a problem much too difficult for him by a different supervisor. From October 1954 I worked at UCC at Lecturer level. And I mean worked: I had 14 lectures per week for a long period of years---with one memorable term when I was asked to give McHenry's lectures while he was in hospital. That gave me 17 lectures per week. All the while I was trying to complete my Ph D thesis---with frequent letters to J L Synge. There were only a few visits to Dublin, and those for seminars or lectures. My research was entirely personal in Cork--except for letters to and fro with JLS. The topic concerned the Hypercircle method; I had previously assisted in the production of Synge's book: The Hypercircle Method in Mathematical Physics (Cambridge, 1957). Mercifully, the lecture load dropped to 11 per week after about half my years as Lecturer at UCC had expired. And I should add that I got away to MIT for the calendar year 1959, and to the University of Queensland for another year, 1964/65. At MIT, I worked with Professor Eric Reissner on problems involving solid mechanics. Two papers on the bending of an annular plate resulted--with D J Evans who contributed numerical skills. 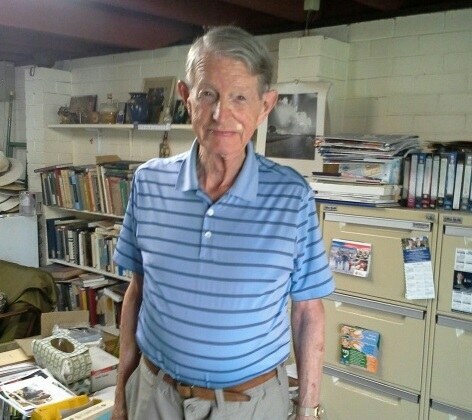 I benefited from contact with Professor L N Howard (who we subsequently invited to the University of Queensland). I enjoyed meeting some very able graduate students, including Charles Conley. And my former student Diarmuid Ó Mathúna was pleasant company, since he was there doing a PhD under Reissner. Norbert Wiener's office was two doors away from mine, and we had several chats. There were some excellent lecture courses, particularly one by Jurgen Moser, broadened my knowledge base considerably. A very fruitful year for me. 6. Who else did you know at DIAS? At DIAS I met Schrödinger, Synge and Cornelius Lanczos, three Senior Professors, of course. And there was a constant stream of eminent people passing through the Institute: Dirac, Polanyi, Kilmister, Heitler, for example---all very good for us young students. Nearer to my level were Jim Pounder, John Roche, Paddy Donohoe, Fr McHugh, and as postdoc visitors, Martin J Klein from USA, Ernesto Corinaldesi from Italy and Daykin from Canada. In 1966, Vincent Hart pulled up his roots one last time and moved to a new life at The University of Queensland, in Brisbane, where he now happily lives in retirement. His career there included serving as department head, supervising research students, and collaborating in Diarmuid Ó Mathúna's book Integrable Systems in Celestial Mechanics (Birkhäuser, 2008).